22-Jul-2006 -- Having been on the road to Nizhniy Novgorod we decided to visit a couple of confluence points and started from the point 56N 40E. In Lakinsk we turned right towards Sobinka. After 2 km we turned to the right again, onto a dirty road and passed through a village. Having directed by GPS receiver we drove up to the river’s bank. 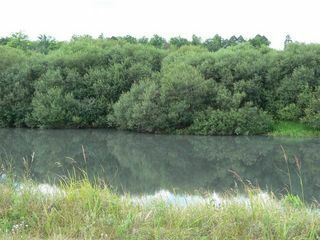 It was an old river-bed of the Klyaz’ma. There is a CP there. We didn’t want to swim over the river, and it was not necessary because we were in 50 meters from the confluence spot. By the way, there was unpleasant smell from the water.